Life changes when your baby becomes mobile. You’ll quickly realize that they’re no longer content to just chill in the bouncy seat. They have tasted freedom, and they don’t want to go back! It’s time to find a walker, but with so many to choose from, it can be a daunting task. There is a walker out there that’s just right for your baby, and we help you find it. Sit back, relax, and read on to find the best baby walker here. There is a certain amount of controversy surrounding the use of baby walkers, so it’s necessary to make a few recommendations about their use. First, a baby should never be left unattended while in a walker. While some assume that popping their little one in a walker will give them some time to go about other business, the opposite is true. Always pay close attention to your child while they are utilizing the walker. Second, never let your baby near any type of stairway while they are in the walker. Make sure basement doors are closed and any other access to stairs is blocked. The third recommendation is to limit the time baby spends in the walker. It isn’t good for your child to stay in it for excessive amounts of time. Used wisely and adhering to these simple recommendations will ensure the walker is a useful developmental tool for your blossoming walker. As your child grows so does their curiosity about the world around them. Using a walker is a way to foster independence, and it allows them a way to explore in a safe environment. It helps them develop balance and strengthens their leg muscles in preparation for doing it all on their own. In addition, most walkers on the market today include interactive activities and developmentally appropriate toys to help baby’s brain development right along with their physical development. There are a couple of developmental milestones that your child needs to meet before they are ready to tackle a walker. They should be able to sit up on their own. They should be able to crawl. Using a walker before the baby is ready is detrimental and not safe. In addition to these recommendations, some parents choose to wait until their baby is pulling up on things before using a walker. This isn’t necessary, but it’s up to your discretion. You know that baby needs to sit up and crawl in order to be ready for a walker, but before you start shopping, you need to know what to look for and some things you should take into consideration. Electronic or Non-electronic: This is largely up to your personal preference as a parent. A walker with all the bells and whistles has definite benefits. The interactive nature is good for baby’s developing brain and the activities are designed to hold their interest. The flipside of this is that some parents may not like the noise that can come from one of the more high-tech walkers. In addition to that, the lights and noise can be overstimulating for a child with sensory issues. There is the added benefit that a non-electronic walker doesn’t require batteries. Attached toys or minimalist: In the same vein as the electronic vs. non-electronic question, there are advantages and disadvantages to having toys attached to a walker. While toys can hold baby’s attention and can add to their stimulation and brain development, they also have some disadvantages. If an attached toy breaks it can be a safety hazard. They also make it a little more difficult to clean. A seated walker with no toys attached is easier to use for snack time and space can also be used to put different toys and books on, which can also keep your child from getting bored with the same activities. Sit, stand, or transitional: There are several different types of walkers. The traditional kind is one in which the child sits in a seat while they move themselves around. There are also push walkers that don’t have a seat but instead require the child to walk along behind, pushing as they go. A third style is a combination of the two. Some walkers can transition from a seated walker to a push walker as the child grows and becomes more steady on their feet. Baby’s age: While certain manufacturers have guidelines for their products, the standard rule is what we mentioned above: the child should be able to sit up and crawl before they can be safely placed in a walker. Flooring: When choosing a walker, consider the main type of floor that it will be used on. Most walkers will work on hard floor or carpet, but be sure to check the reviews and product descriptions for information. There are some characteristics that a walker should have in order to be the best benefit for your baby. Sturdiness: A safe walker will be sturdy enough for baby to support a baby without risk of tipping, whether it’s a push walker or a seated one. Stoppers, friction pads, or brakes: The walker you choose should have some sort of feature that keeps it from slipping and sliding in the wrong direction on hard floors. Ability to make height adjustments: Babies grow quickly. Seated walkers should be able to adjust to different heights as baby grows. A push walker should also have a similar feature to fit babies of varying sizes. Comfortable seat: It’s important that your baby’s time in their seated walker be as enjoyable for them as possible. A padded seat that offers adequate support is important. The Joovy Spoon is a great all around walker. It has a very modern, sleek look that would blend with any decor. The materials this stroller is made from are BPA, PVC, and Phthalate free so you don’t have to worry about exposure to harmful chemicals. The base of the walker lends to its stability, and its width ensures that little fingers won’t get pinched. The ample tray has a removable insert that can be tossed in the dishwasher, making this walker a great place for baby to enjoy a meal. Before and after snack time, the tray is large enough to hold several of baby’s playthings. The seat is strong, sturdy, comfy and best of all it is machine washable. The large wheels make it ideal for use on carpet or hard floors. The Spoon has three height adjustments to grow with baby. This walker would be a great choice for anyone who is looking for a quality minimalist walker that’s safe, sturdy and isn’t too visually busy. Check out the Joovy Spoon in action here. 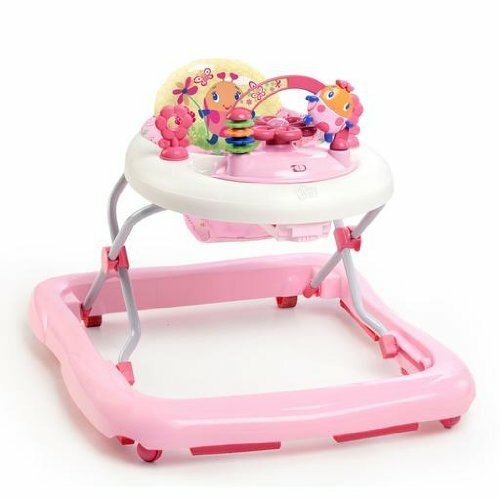 This baby walker is perfect for little ones who are always growing. The starting age is 6 months, when your baby can sit up without help but without the leg strength to walk on their own. It has 3 adjustable seat heights, so you can keep their little feet on the ground. As they grow and strengthen their legs, you can raise it as needed. The high seat back also gives them some support. There are spots on the front table area for multiple colorful toys to be attached, which light up, make sounds, or play music. All those noises have volume control as well. There are also a couple of loops to add extra toys your baby loves to play with. And for floor play, the attached toys are removable. The wheels on the bottom let your baby propel themselves across the floor as they strengthen their little legs. This adorable walker comes in three colors, Green, Juneberry Delight, and Roaming Safari. Maximum weight requirements: Up to 26 lbs. The Creative Baby Cruiser grows with your baby, letting them sit inside until their legs are strong enough to walk on their own. The little convertible car can be adjusted for height, so your baby can always reach the ground. It has a steering wheel with a working horn, a shifter, side mirrors, and even a play navigational map so they can plan their pretend trips. 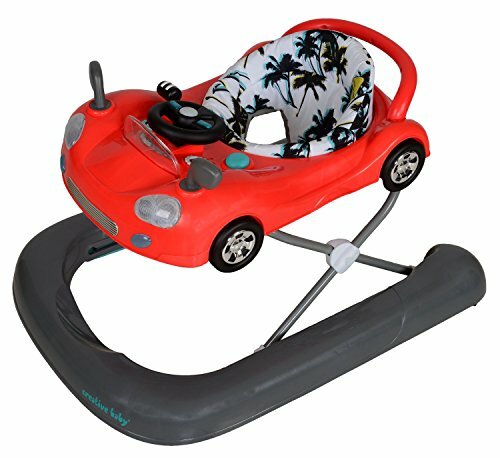 There are also lights and music to keep baby entertained as they cruise through your living room. The seat is soft and padded, plus removable to make it easier to wash it. On the front, there are safety friction pads, which add some cushion if baby runs into a wall. When your little one is ready to get behind and push it, there is a wide rear handle that gives them plenty of holding space. Another handy feature is that when baby isn’t using it, you can fold it down for more compact storage. Weight recommendations: between 16 and 26 lbs. 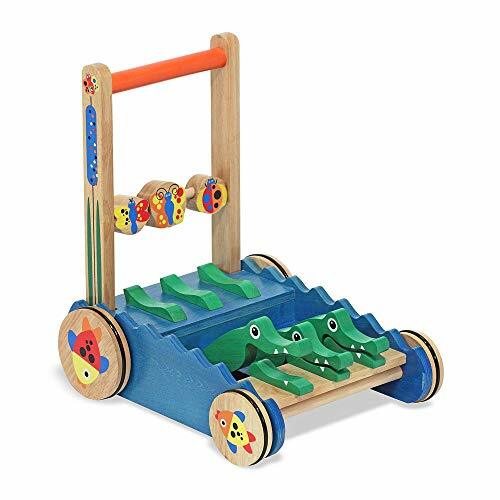 This Melissa and Doug walker is handcrafted wooden walker is intended for ages one and up. It has three alligators on the front that chomps with every step. The clacking, chomping alligators encourage the child to keep going and going. This is not only fun but also teaches basic cause and effect concepts. It has visually stimulating paintings on the handles and the wheels. The bright colors come from child-safe paint so there’s no worry about your little one coming into contact with toxic chemicals. Spinning butterfly and ladybug beads encourage fine motor development. The Chomp and Clack walker would be a great choice for a child who is in those very beginning stages of walking as it’s sturdy enough to give them the support they need. The walker covers some important skills like gross motor, fine motor, hand-eye coordination, and the concept of cause and effect. It’s also ideal for parents who aren’t interested in all the electronic components that other walkers have. This adorable electronic walker gives your baby two ways to play. First, they can sit in front of it and enjoy the activities. These include buttons to press, spinners, and page flipping. There are also sounds, phrases, and music to go with these fun little activities. They even learn as they play, thanks to the alphabet and numbers played through the little speaker. When they are strong enough to stand, there is an easy-grasp handle on the back they can use to support themselves as they learn to walk. The four wheels are large and sturdy, which allows them to move smoothly over any type of surface. The wheelbase is also thick and strong, so it can handle the baby’s weight as they lean on it. This little walker has an adorable zebra design that will attract any baby’s interest. It also has a great low price that will fit into any parent’s budget. The world of baby walkers is vast and offers many options. The walkers that we have highlighted here have been chosen because they fit the bill in terms of the features that are necessary for the baby to have the most developmentally sound and the safest experience possible as they learn to walk. 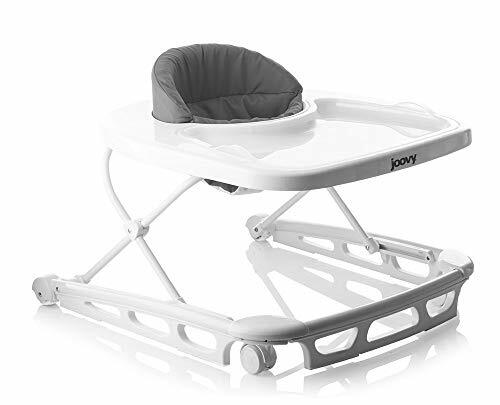 The Joovy Spoon is an excellent choice for an all-around seated walker. The Fisher-Price Learn With Me Walker gives babies the support they need to walk and entertains them the rest of the time. The Creative Baby 2-in-1 Walker is perfect for those who want one that works with your child at every stage of their walking development. The Bright Starts Walk-a-Bout Walker is a safe seated choice that gives your baby some mobility as they learn to move on their own, with some toys and music to keep them happy when they stay still. A really good, low-tech choice for a push walker that gets the job done without overstimulation is the Melissa and Doug Deluxe Chomp and Clack. It’s simple, safe, and fun. We’ve given you some really great options for walkers for your sweet little one, so now it is time to get shopping for the best baby walker for you! Thank you for visiting MyTinyTraveller.com. If our article has helped you make a decision about the best baby walker for you, please click through to Amazon using one of our ‘Buy Now’ buttons. 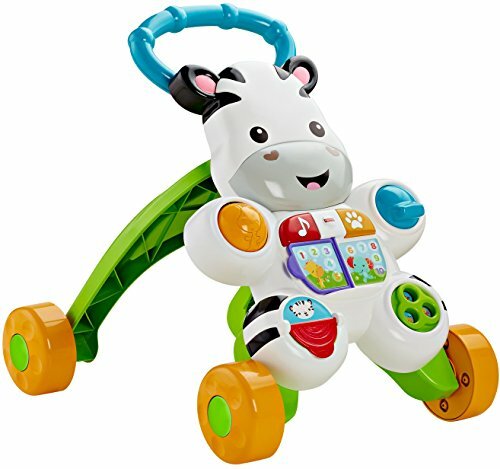 We are an Amazon Affiliate website and we keep our website running through the small commission we receive when you purchase your baby walker from Amazon after visiting our site. There is no extra expense for you – the price is the same as if you went to Amazon directly. If you’re looking for more than the best baby walker, please review our best stroller buyers guide.